As an entrepreneur, you did not enter into business to become a human resources manager. You have no interest in contending with payroll twice a month, negotiating benefits for your employees, or worrying about how to comply with a litany of government regulations. You entered into business in order to sell a product or provide a service, and generate revenue doing what you do best. But HR is a necessity when you have employees. And what could be better than taking a piece of your business – which although a necessity, is also a distraction – off your plate, and making it somebody else’s problem? 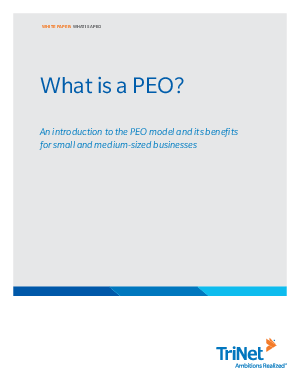 This is what a PEO can provide and in this paper you’ll learn about all its benefits.